My friend DaveS at Fresh Air Finishers sent me this link, and I am passing it along to you. 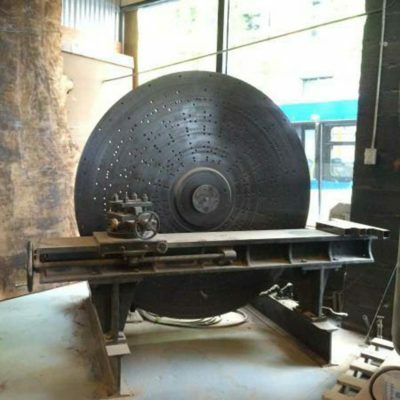 If you are into turning mega-bowls, this is the machine for you! I wish I had the money, space, and need for it, but to be honest I don’t, I don’t, and I don’t. It of course drew my memory back to my formative days in the pattern shop when we had an analogous machine we used to turn pump shell patterns for the foundry and fabricators to then do their magic. Whenever I am at a woodworking event and someone brags about turning a “really big bowl” of 18-24 inches, I sometimes resist telling my tales of turning “bowls” up to 12-feet in diameter. Our setup was such that there was a freestanding tool rest on which we stood, leaning into the workpiece and at times were mostly literally inside the bowl of the pump shell we were turning. The heat of the cutting was such that I wore a welders glove on my tool-rest hand to keep from getting burned by the hot chips. Is was an intimidating experience, to be sure, and I will remember to my death bed my first “solo” session. The Master of the pattern shop, Johnny Kuzma, handed me the turning chisel and said,”Good luck, kid.” Then he stepped back and threw the switch.